This article was originally published by Fast Company. Click the link below to view the original article. A new report compares California’s reputation as a diverse, progressive bastion to the hiring and treatment of people of color in its nonprofits. In mid-2017, Building Movement Project, a nonprofit research group, released a national report showing that nonprofits and foundations struggle internally with diversity and equality issues. The well-known stats around this issue are worth repeating: more than 80% of these group’s leaders are white, a stat that goes up among the biggest organizations. BMP’s Race to Lead report surveyed more than 4,000 nonprofit workers to point out why that’s so nefarious: top-level candidates of color aren’t just equally as qualified for these jobs, they’re more interested in being promoted, but feel they’re often overlooked because they aren’t the right “fit”–a rather tame code word for what’s likely implicit racial bias. Things are supposed to be working a little differently in California. About a decade ago, a report from the Greenlining Institute, a policy, research, and advocacy organization, showed that charitable investments were largely ignoring communities of color. Post-report, many of the state’s biggest philanthropic funders pledged $30 million to encourage more diversity among charity group leaders, in the hopes of ending the cultural gaps caused by white privilege: It’s often people of color who best understand how to effect change within their own communities. 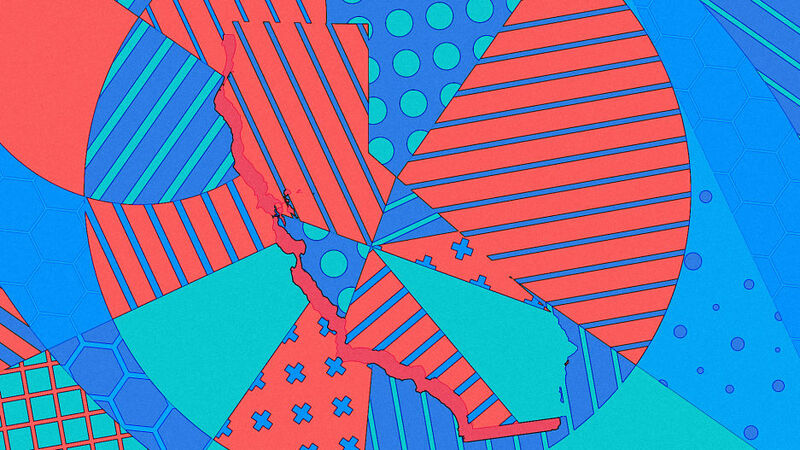 What’s happening in California is important not just because it’s generally considered to be a progressive bastion, it’s also a state where the majority of residents are now people of color, the demographic direction in which the country is heading. To figure out if industry efforts toward diversity are paying off there, BMP isolated the data from its California-based survey respondents (800 people total) and compared it with what was happening in other states. The result is a new report called California’s Race To Lead, in which BMP shows that there is a “Golden State difference” in forward progress, even if there’s still a long way to go. 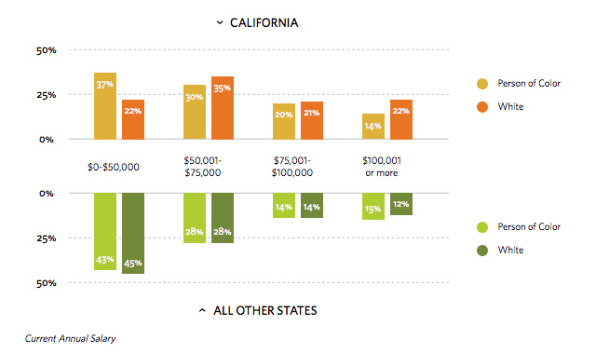 BMP notes in the report that California is home to 250,000 nonprofits, about 25% of which are led by people of color. That’s better than the national average of 20% but definitely not representative of the state’s population or service community. There are other issues, too. As the chart below shows, just because more employees of color have seemingly advanced, doesn’t mean they’re being treated fairly. In fact, people of color within California’s nonprofits may be underpaid even more frequently than those elsewhere: 54% report feeling frustrated about their inadequate salary; that’s actually more (by 4%) than counterparts in other states. It’s not just that some areas may have a higher cost of living. The percentage of white people upset about their paychecks actually dropped a bit. In general, people of color’s perceptions of other challenges, like that there may be “few opportunities for advancement” and a “lack of relationships with funding sources” dropped compared to other states, but still remains high with close to 40% of respondents agreeing with those things. When it comes to the question of whether race or ethnicity has played a role in the respondent’s career advancement, nearly 30% of non-white industry workers felt discriminated against. That’s down 6% compared to other states, but still a huge proportion. The report dives deeper into the question of pay equity, showing that the biggest disparities in California happen at the low and high end of the spectrum: 37% of people of color hold jobs paying less than $50,000 while just 22% of white people do. When it comes to making $100,000 or more 22% of white employees in the sector hold those jobs, compared to 14% of people of color. Both of those inequalities are far higher than the average among other states. Things are especially unequal at CEO and executive director level. As the report notes, “A third (34%) of POC leaders in California earned $100,000 or more, compared to 47% of white leaders.” In other states, it was more like 33% to 28%, respectively. The obvious takeaway is that just funneling more money into the sector isn’t enough. BMP has several suggestions for how to improve things, but the most obvious is to avoid implicit bias by ensuring that groups audit themselves regularly to make sure their payment and hiring practices are in line with their stated values. That doesn’t seem to be happening right now. 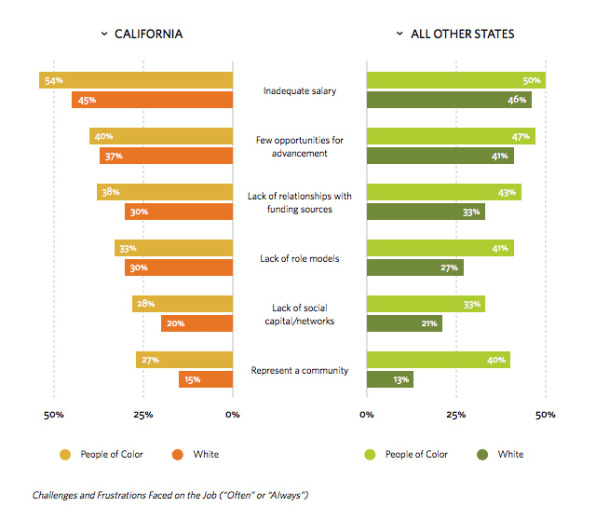 In fact, in California, the majority of people of color within the philanthropy sector feel like recruiters don’t do enough to spot and elevate qualified candidates for better positions, that white boards don’t support that concept either, and that those who don’t get the jobs they’re seeking are still seen as not quite the right “fit” there.